India’s tea exports to Russia have fallen to 40 million kg. Mindful of the Russian fondness for tea, a delegation of Indian tea producers and marketers sought to showcase strengths of Indian tea at the World Food Exhibition in Moscow. An Indian delegation comprising 11 major tea producers and three distributors visited Moscow between September 14 and 17 to meet buyers at the World Food Exhibition-2015. It was the ‘tea delegation’s’ second visit this year after a trip in February coinciding with “Prodexpo-2015.” The earlier visit was to participate in a product expo, while this tour was intended to showcase Indian strengths in this field. Sujit Patra, additional secretary of the Indian Tea Association led this delegation which emphasized India’s strength, particularly in higher-value orthodox (hand-processed) tea over the more usual CTC (crush-tear- curl) tea. The Russian market has been a major consumer of Indian orthodox tea, but now has also taken to CTC in a big way. India exports around 208 million kg of tea annually, around a quarter of which was to Russia. However, recently, India’s tea exports to Russia have fallen to 40 million kg. Indian tea exporters feel there is huge scope to bring it back at least to the previous level of 50 million kg. Russia imports around 160 million kg of tea annually. Russia is the world’s fourth largest tea consumer, and India is making a strong effort to tap this large market aggressively, after a gap of ten years. Raising the level of Indian tea exports to 50 million kg is not the only reason motivating Indians to come to Moscow to sell more tea. Indian tea exporters have been trying to woo the Russians to increase imports of tea from India as a balancing act following India’s slumping export trend, mainly since the Iran payments crisis. They also now want to take advantage of the falling rupee against the dollar, as this will help the Indian tea exporters to raise their earnings. The task of bridging this gap will not be easy. A member of the Indian delegation told RIR that producers and exporters in India face several problems which they must resolve to win back a large share of the Russian tea market. This includes very tough competition, in terms of quality and lower pricing of tea from rivals, Sri Lanka and Kenya. Sri Lanka, a producer of the orthodox variety, and Kenya, a producer of CTC tea, have emerged as major exporters of tea to Russia. Unlike in India where domestic demand for tea is ever growing, Sri Lanka and Kenya have low domestic demand and hence can raise tea exports, on which they are dependent. Sri Lanka exports around 60 million kg of tea annually to Russia, and is India’s main competitor in the Russian market. The decline in Indian tea exports has largely been in the wake of increased competition from Sri Lanka and Kenya which offer tea at lower prices than India. 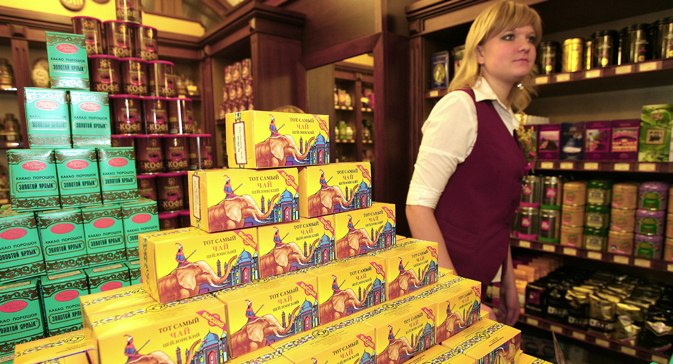 Tea producers from European countries, including “Ahmad Tea” and others have also gained a place in the Russian market. During talks with the Russians, the Indian delegation discussed issues related to quality, pricing, packaging and shipment of tea to Russia. They also discussed trademark protection and Geographical Indicator (GI) tags given to Indian tea, including world-famous brands “Assam,” “Darjeeling” and “Nilgiris.” Russia has agreed to extend the benefit for registration of trademarks and GI for Indian tea as available to WTO member-countries. Patra said he was confident India would be able to bridge the gap between Russian demand and Indian exports. “I think, the measures discussed during the meetings with our Russian counterparts and buyers will certainly help protect the quality of famous Indian tea brands and boost tea exports to Russia, in the near future” he said. According to Indian delegates, in the aftermath of Western sanctions against Russia and falling oil prices in international markets, the Russian ruble has continuously declined. So Indian tea exporters are facing pressure from Russian buyers to reduce the prices of tea, which they claim does not even meet the cost of tea production. To avoid negative consequences of the sliding ruble, the Indian tea industry is also exploring possibilities of special payment arrangements to step up tea shipments to Russia. One of these possibilities is to adopt the rupee-ruble trading mechanism. They argue that a rupee payment mechanism will allow Russians to settle payments in rupees with banks in both countries, facilitating accumulation of claims under a central arrangement. A joint working group of representatives from central banks of both countries is working on the issue. The Indian Tea Association asked the Indian Tea Board to seek an early resolution to this payment mechanism. An agreement could be signed during Prime Minister Narendra Modi’s Moscow visit for the annual Indo-Russian summit with President Vladimir Putin, this December. Indian tea companies are also looking to revive tea exports to Russia by forming joint ventures with Russian counterparts to meet their warehousing needs, to pack and store tea under strict control. This will help maintain the quality of India’s original brands preferred by the Russian consumers. Some Indian companies, like “Golden Tips Teas India” and “Godfrey Phillips India Ltd,” are also planning to export tea to Russia in tea bags, a trend now extremely popular in the country.